丁国伟, 叶少东, 黑发欣, 连巧龄, 裴晓迪, 柏建芸, 周丹, 杨晴, 惠珊, 王伟, 屠爱霞, 庞琳. Ding Guowei, Ye Shaodong, Hei Faxin, Lian Qiaoling, Pei Xiaodi, Bai Jianyun, Zhou Dan, Yang Qin, Hui Shan, Wang Wei, Tu Aixia, Pang Lin. Ding Guowei, Ye Shaodong, Hei Faxin, Lian Qiaoling, Pei Xiaodi, Bai Jianyun, Zhou Dan, Yang Qin, Hui Shan, Wang Wei, Tu Aixia, Pang Lin. Sentinel surveillance for viral hepatitis C in China, 2016-2017[J]. 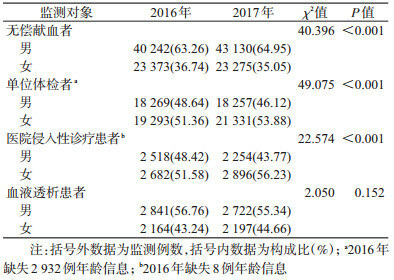 Chinese Journal of Epidemiology, 2019, 40(1): 41-45. Abstract: Objective To understand the prevalence of hepatitis C virus (HCV) infection in 5 populations in China during 2016-2017 and provide evidence for the estimation of prevalence trend of hepatitis C and evaluation on the prevention and control effect. Methods A total of 87 national sentinel surveillance sites for hepatitis C were set up in 31 provinces (autonomous regions and municipalities) of China to obtain the information about HCV infection prevalence in 5 populations, including volunteer blood donors, people receiving physical examination, patients receiving invasive diagnosis and treatment, patients receiving hemodialysis, and clients visiting family planning outpatient clinics. From April to June, 2016 and 2017, cross-sectional surveys were repeatedly conducted in the 5 populations and blood samples were collected from them for HCV antibody detection. Results In 2016, 86 sentinel sites completed the surveillance (one sentinel site was not investigated), and 115 841 persons were surveyed. The overall HCV positive rate was 0.38% (442/115 841, 95%CI:0.23%-0.53%). In 2017, all the 87 sentinel sites completed the surveillance, and 120 486 persons were surveyed. The overall HCV positive rate was 0.37% (449/120 486, 95%CI:0.23%-0.52%). In 2016 and 2017, the anti-HCV positive rates were 4.46% (223/5 005, 95%CI:2.18%-6.73%) and 4.39% (216/4 919, 95%CI:2.29%-6.50%) respectively in hemodialysis patients, 0.85% (44/5 200, 95%CI:0.27%-1.42%) and 0.70% (36/5 150, 95%CI:0.15%-1.24%) respectively in patients receiving invasive diagnosis and treatment and remained to be ≤ 0.25% in volunteer blood donors, people receiving physical examination and clients visiting family planning outpatient clinics. Results for the comparison of the anti-HCV positive rates in the 5 populations indicated that the differences were significant (F=23.091, P < 0.001 in 2016 and F=20.181, P < 0.001 in 2017). 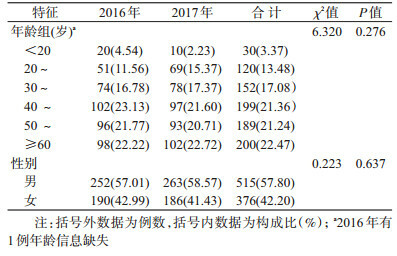 Conclusions Data from the sentinel surveillance of HCV infection on prevalence in China showed that the anti-HCV positive rates varied in the 5 populations during 2016-2017. The anti-HCV positive rate appeared the highest in the hemodialysis patients, followed by that in the patients receiving invasive diagnosis and treatment, and the prevalence of HCV infection in other 3 populations were at low levels. World Health Organization. Global Hepatitis Report, 2017[DB/OL]. (2017-04-01)[2018-03-01]. http://www.who.int/hepatitis/publications/global-hepatitis-report2017/en/. 苏迎盈, 汪宁. 丙型肝炎病毒感染主要危险因素的Meta分析[J]. 中华流行病学杂志, 2011, 32(9): 940-945. 王岚, 李东民, 葛琳, 等. 2009-2012年中国艾滋病哨点监测人群丙型肝炎病毒感染状况分析[J]. 中华流行病学杂志, 2013, 34(6): 543-547. 陈园生, 李黎, 崔富强, 等. 中国丙型肝炎血清流行病学研究[J]. 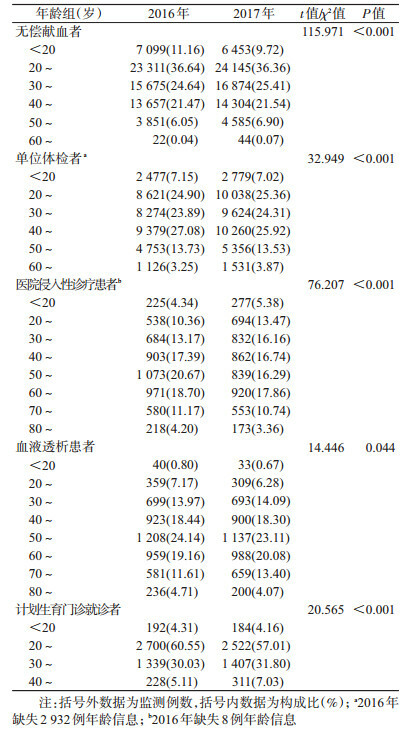 中华流行病学杂志, 2011, 32(9): 888-891. 秦倩倩, 郭巍, 王丽艳, 等. 1997-2011年中国丙型肝炎流行特征分析[J]. 中华流行病学杂志, 2013, 34(6): 548-551.